Inventory We are a resale marketplace, not a box office or venue. Ticket prices may exceed face value. This site is not owned by Boston Opera House . 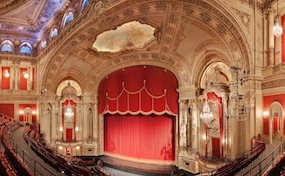 The Boston Opera House has long been an integral part of entertainment options in Boston. Offerings from the Boston Opera House have included modern Broadway hits such as Wicked, War Horse, The Jersey Boys, The Lion King and the and performances of Book Of Mormon. As well as an annual offering of the the Christmas classic The Nutcracker by Tchaikovsky. The Boston Ballet Company and Broadway Across America are the main tenants for the Boston Opera House and they will remain the primary source of the entertainment line up. For over 100 years the Boston Opera House and operated in some fashion and the past few have really led to a resurgence of higher brow theatre in Boston. The most recent renovation of the Boston Opera House has really modernized a classically designed theatre with all the gilded epitaphs that one would expect. Enjoying a musical inside the Boston Opera House is like taking a trip back in time and is a highly recommended experience. OperaHouseBoxOffice.com is an independently owned and operated company that concentrates in the online sales for all events in the secondary market. We are not currently associated with any official website, box office, venue, or primary supplier. Ticket prices may be above or below face value and will change quickly with demand. To order tickets to all Boston Opera House events you may pick up the phone and call our operators at anytime or follow the process online through checkout.